The Italian fashion house is under fire after showing jacket that appeatrs to be a replica of the legendary Harlem-based designer's creation. Gucci posted an image on Instagram with a caption explaining that the fur, puffy sleeved logo jacket from its Cruise 2018 collection was inspired by Dapper Dan. While it’s nice of the brand to finally acknowledge the source of its design, the recognition comes after the Italian fashion house was called out for plagiarism and cultural appropriation. Furthermore, the tardy post is by no means an apology for knocking off Dapper Dan’s design. It was only a few weeks ago when we were praising Gucci for its celebration of diversity in the brand’s pre-Fall 2017 campaign, which featured an all-Black cast of models and dancers. But sadly our admiration of the Italian fashion house is being cut short, thanks to an unfortunate moment during Gucci’s Resort/Cruise 2018 fashion show in Florence on Monday. That moment came when a Black model hit the runway sporting a jacket design that is almost an exact replica of an iconic coat designed by the legendary Harlem-based designer Daniel Day, better known as Dapper Dan. 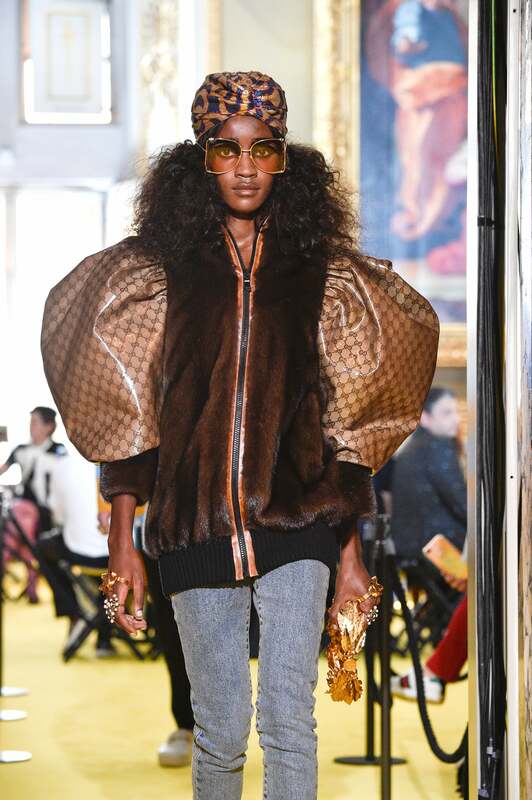 Anyone familiar with Dapper Dan’s work (aka anyone who was around in the 80s and 90s), which was revered in the Hip Hop world will immediately recognize that Gucci’s fur bomber jacket with ginormous logo-printed puff sleeves is a blatant copy. The only major difference is that Dapper Dan’s original design used fabric emblazoned with the Louis Vuitton logo — and is unquestionably fresher (read: better) than Gucci’s knockoff. Authenticity just has a way of invoking excellence. We have reached out to Dapper Dan for comment and are awaiting an official response. Beyond plagiarizing — which is huge issue by itself — there is also the problem of cultural appropriation. Black culture (along with other ethnic cultures) is continually pillaged by the fashion and beauty industries without receiving its proper recognition. When asked about the inspiration for the Cruise 2018 collection — which was overall a stunning representation of Gucci’s penchant for over-the-top glam with a whimsical flair — Gucci’s creative director Alessandro Michele noted the Mediterranean, as well as the Greek and Roman cultures as major influences. Oddly enough he also mentioned that Los Angeles played a big role. But Michele should had also shouted out Harlem and Dapper Dan’s masterful creations of reimagined logo-laden designer fabrics that are coveted around the world. Sean “P. Diddy” Combs, LL Cool J, Mike Tyson, Floyd Mayweather and Busta Rhymes are just a few of the celebrities who have worn Dapper Dan’s signature looks. Unfortunately Dapper Dan was targeted for copyright infringement and his 125th Street boutique was subsequently shut down soon after in 1992. Nonetheless, his legacy lives on and is most certainly a story that needs to be told. Not only is Dapper Dan still designing for select private clients, his work clearly still continues to inspire. This past winter Louis Vuitton teamed up with the famed streetwear brand Supreme and noted Dapper Dan as an inspiration for the eye-catching designs. Giving credit where credit is due is always in style. Furthermore, Gucci has Black culture and celebrities to thank for much of its renewed popularity. Beyoncé, Rihanna, The Migos, Gucci Mane, ASAP Rocky and other stars have been keeping the latest designs in heavy rotation. So while we help celebrate the brand financially and legitimize its relevance, the same respect is not shown in return. Ultimately, it’s exhausting having to explain over and over again how disrespectful the culture vulturing is. However, we will persist until everyone gets the memo…reads the memo…and adheres to our plea.